I was working on a case recently and thinking back to a conversation that happened around an imaging class at NATIA years ago. It focussed on what wasn't in Photoshop - and how to best document your steps. Here's a screen-shot of a section of a report that was generated out of an AmpedFive project that I was working on. I had some periodic noise that had to be dealt with and so I worked the files in AmpedFive. 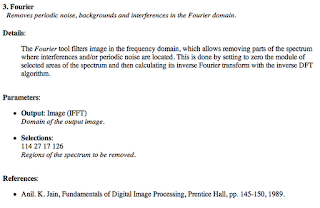 The report details that my third step was a Fourier transform, gives the details of what was done in simple terms, defines the parameters of my work, and gives the published source for the step. 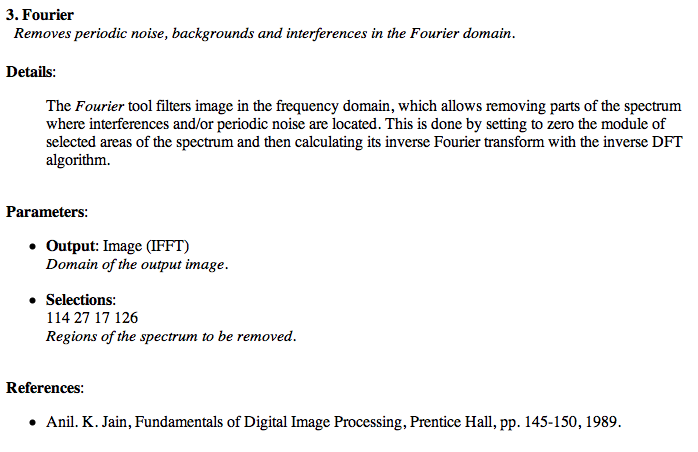 Each filter in AmpedFive gets this kind of treatment in the report. How cool is that?! AmpedFive is quickly becoming my tool of choice. The more I put it to the test, the more it amazes me. Last year, I introduced you - gentle reader - the President's Subcommittee on Forensic Science. One of the themes of the work from this body, and the NAS report, is that if there's a certification in your field of work ... you should have it. LEVA has their certifications. Some argue that the value of LEVA's certification is outweighed by the high cost to attain the title, Certified Forensic Video Analyst (CFVA). The IAI now as a competing offering - Certified Forensic Video Examiner. The IAI's path to certification is inexpensive in comparison to LEVA. I received an e-mail asking about the difference between the two - and the semantical difference between "analyst" and "examiner." Bing's dictionary defines analyst as an "expert who examines something: somebody with specialist knowledge or skill who studies or examines something by separating it into its constituent parts and gives an assessment, description, or explanation of it." The root of examiner is examine, "to inspect or scrutinize carefully." Given the Subcommittee or NAS, should a person engaged in FVA have either of these, or both? Is one more valuable vs. the other? Should an analyst be thought to outrank or be superior to an examiner? What's in a name? Before you answer that ... what about Adobe's ACE program? Again, the premise is that if there's a certification, you should have it. Do you use Photoshop or PremierePro? There are separate ACE exams for these products. What about Acrobat? If you make PDF presentations, should you need to be an Acrobat ACE? How about Avid? Avid has a Media Composer certification. If you bought a MC system from Ocean Systems, do you need to be Avid certified? Herein lies the problem. The goals of the certification programs of Adobe and Avid are not centered on law enforcement. In order to be certified on their products, you will have to master tools and techniques that you may never use in the course of your work. Folks further argue that LEVA's training path is too Avid centric and that the IAI test focusses too much on broadcast TV. You name the test or certification, and there'll be folks with arguments against it. With this in mind, what's the real value to certification? Yesterday, I said that while I still love Photoshop, I'm falling out of love with it. The manufacturers of Photoshop and the other commercial products that I use are targeting a different audience. If my workflow only uses specific pieces of Photoshop, should there be allowances for this practice in the certified user/expert test? What if the manufacturer of your tool of choice offers no certification? I like to be honest with people and answer direct questions directly. With the successive releases - CS4, CS5, CS5.5, and now CS6, I've received a ton of questions about upgrading. With tight budgets, folks are trying to figure out if the newest versions are worth the price vs. what they've got with CS3. Adobe's cleaned up the code. They've gone 64 bit. They've changed the UI. They continue to improve ACR. If you've got the latest and greatest hardware, your CS apps will scream. This leaves me in a quandary. I've upgraded each time - but the majority of my LE readers have not (based on reader feedback). I've written extensively on the features in CS3 ... and those things that have changed/improved with each successive release. So ... don't be alarmed ... but I'm having a bit of a mid-life crisis with Photoshop. I love it - but those passionate in-love feelings fade with each new version. I've been hearing rumors about a LE specific release for a while now, but nothing is yet available. So, as Adobe courts photographers and digital content creators (their primary market) ... there's little for LE to cheer about with each new release date. Yes CS6 is out. Yes, I own a copy. Yes, I like it - I like it a lot. But, do I feel the same way about it as I did with CS3? Unfortunately ... no. With so many of us using our personal phones and iPads for work (Bring Your Own Device), I thought that this article from the InfoLawGroup would be worth a read. "... The first rule of policy development and compliance is to create policies that can be followed and will be followed when implemented. Policies should not be aspirational and should reflect the “reality on the ground” as closely as possible. If certain BYOD activities are already taking place, it may be necessary to develop policies that reflect those activities or terminate or limit certain activities on a going forward basis ..."
"... Overall, the policy and control set around BYOD should be made flexible enough to deal with unusual situations. This is especially important in the BYOD context because personal device technology and risks are constantly evolving at a very rapid pace ..."
"... Device configuration requirements may include enabling wiping/bricking capabilities of a device, disabling automatic back-up or cloud storage of data stored on a device, prohibiting the use of a personal device as a mobile hotspot, requiring or prohibiting certain application installation, enabling auto-patching for operating systems and applications, and prohibiting jail breaking or modding of devices. The policy will often also require employees to install mobile device management or other software on personal devices. These system, software and configuration requirements often vary depending on the particular type of personal device and/or operating system, and may need to be updated when new devices are being used or new security vulnerabilities discovered ..."
It's hard to start a business. It's even harder to start a technology company - given the huge up-front costs. With the rise in success stories from people who've used Kickstarter for creative projects, some are considering micro-finance or crowd funding as a source of venture capital. As attractive as it might sound, the JOBS Act adds a ton of complexity. Here's a great article on the subject that breaks down the real issues that you need to consider before going down that road. Here's an interesting article on the emerging trend of developing a social media strategy for high-profile court cases. Are you on Twitter? Facebook? Do you use these for personal or professional purposes? It's an interesting read to see where folks are taking social media these days. Adobe's Julieanne Kost addresses Photoshop's slow video preview, "to preview video faster in Photoshop, zoom out until the height of the canvas is less than 540 pixels. At this smaller preview size, Photoshop CS6 automatically plays and scrubs at lower resolution (and therefore faster)." If you're concerned about frame skipping when working with video in Photoshop, here's a cautionary note from Adobe's Julieanne Kost, "... if the project has audio, and the audio button is ON, Photoshop will skip frames as necessary (regardless of the Allow Frame Skipping setting) to keep up with the audio (in real time)." The more I work with AmpedFive, the more I like it. One of the cool features, especially for those in a Frye state, is the reporting feature. AmpedFive's automatic report generation feature includes the sequence of all operations applied to all files, the used parameters and a detailed description of their usage and implementation. It also has links to the relevant science behind the operations. How cool is that? AmpedFive Professional is the perfect addition to your tool kit. It's purpose built for the forensic analysis of video and images. Check out a demo today. I think that you'll like it. Here's a good reason to process video on a CUDA capable workstation. The variable-radius bicubic scaling done on the CPU is very similar to the standard bicubic mode in Photoshop, though the Premiere Pro version is multi-threaded and optimized with some SSE instructions. Even with these optimizations, it is still extremely slow. For high-quality scaling at faster-than-real-time processing, you need to use a CUDA card. For export, scaling with CUDA is always at maximum quality, regardless of quality settings. (This only applies to scaling done on the GPU.) Maximum Render Quality can still make a difference with CUDA-accelerated exports for any parts of the render that are processed on the CPU. Over time, we are working on reducing the list of exceptions to what can be processed on the GPU. For an example of a limitation that can cause some rendering to fall back to the CPU, see this article: “Maxium dimensions in Premiere Pro CS5″. When rendering is done on the CPU with Maximum Render Quality enabled, processing is done in a linear color space (i.e., gamma = 1.0) at 32 bits per channel (bpc), which results in more realistic results, finer gradations in color, and better results for midtones. CUDA-accelerated processing is always performed in a 32-bpc linear color space. To have results match between CPU rendering and GPU rendering, enable Maximum Render Quality. Note: There are two places to enable or disable Maxium Render Quality—in the sequence settings and in the export settings. The sequence setting only applies to preview renders; the export setting (which defaults to the sequence setting) overrides the sequence setting.